Professor Kim's laboratory focuses on innovating bioinspired engineering principles to create biomedical platform technologies for uncovering the fundamental questions in human health and disease by integrating multidisciplinary approaches such as microfluidics, tissue engineering, and applied microbiology. 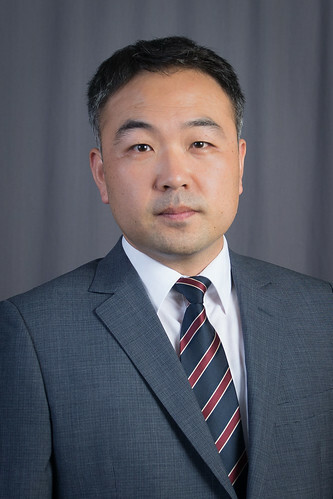 His research interests include developing Biomimetic organ model (Human Organs-on-Chips), Microengineered host-microbe ecosystem, Programmable synthetic microbiome, and Humanized diagnostic/therapeutic platform for clinical, pharmaceutical, and environmental applications. Hyun Jung Kim and Donald E. Ingber. Gut-on-a-Chip microenvironment induces human intestinal cells to undergo villus differentiation. Integr. Biol. 2013, 5, 1130-1140. Hyun Jung Kim, Dongeun Huh, Geraldine Hamilton, and Donald E. Ingber. Human Gut-on-a-Chip inhabited by microbial flora that experiences intestinal peristalsis-like motions and flow. Lab Chip 2012, 12, 2165-2174. Hyun Jung Kim, Wenbin Du, and Rustem F. Ismagilov. Complex function by design using spatially pre-structured synthetic microbial communities: degradation of pentachlorophenol in the presence of Hg(II). Integr. Biol. 2011, 3, 126-133. Dongeun Huh, Hyun Jung Kim, Jacob P. Fraser, Daniel E. Shea, Mohammed Khan, Anthony Bahinski, Geraldine A. Hamilton, and Donald E. Ingber. Microfabrication of Human Organs-on-Chips. Nat. Protoc. 2013, 8, 2135-2157. Kambez H. Benam, Stephanie Dauth, Bryan Hassell, Anna Herland, Abhishek Jain, Kyung-Jin Jang, Katia Karalis, Hyun Jung Kim, Luke MacQueen, Roza Mahmoodian, Samira Musah, Yu-suke Torisawa, Andries D. van der Meer, Remi Villenave, Moran Yadid, Kevin K. Parker, and Donald E. Ingber. Engineered In Vitro Disease Models. Annu. Rev. Pathol. Mech. Dis. 2015, 10, 195-262. Mathieu Odijk, Andries D. van der Meer, Daniel Levner, Hyun Jung Kim, Marinke W. van der Helm, Loes I. Segerink, Jean-Phillipe Frimat, Geraldine Hamilton, Donald E. Ingber, and Albert van den Berg. Measuring Direct Current Trans-Epithelial Electrical Resistance in Organ-on-a-Chip Microsystems. Lab Chip 2015, 15, 745-752. Dongeun Huh, Yu-suke Torisawa, Geraldine A. Hamilton, Hyun Jung Kim, and Donald E. Ingber. Microengineered Physiological Biomimicry: Organs-on-Chips. Lab Chip 2012, 12, 2156-2164.